This movie shows results of the direct time-domain numerical simulation of the flat plate divergence. Instability in the form of divergence is observed only at M < 1. The plate is stable for M ≤ 0.73. 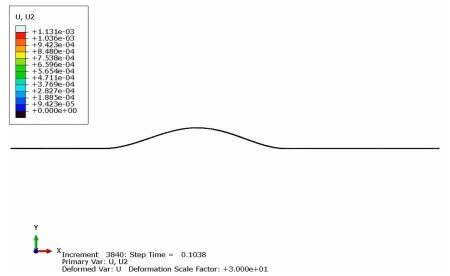 At M > 0.73 the perturbed plate makes several oscillations and stabilizes at a deformed state so that the deflection of the reference point tends to a constant value as t → ∞. The shape of the diverged plate is very close to the first natural mode shape.